I know a lot of my recent posts have been targeting Fall appropriate makeup products, but come on! Do you see this beaut? 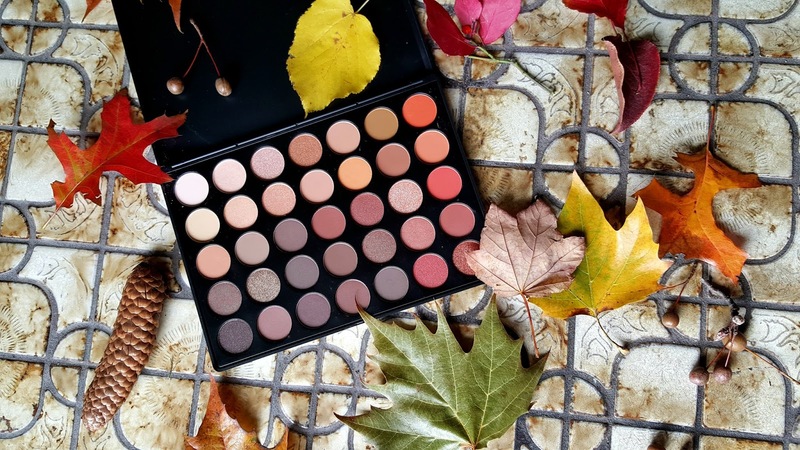 The Morphe 35O Palette is essentially Autumn wrapped up in sleek black plastic packaging. I would actually even venture to say that this palette could potentially be a one-stop shop for most consumers as it contains various shades from light to dark, warm to cool, and matte to metallic and foil. You can truly create so many different looks from this palette at the affordable price of $22.99...that is, of course, if you can manage to get your hands on it (queue diabolic laugh). The palette comes in simple, yet sturdy black packaging with the Morphe logo across the front and a strong clasp closure. The feel and smell is very reminiscent of the old school Coastal Scents and BH Cosmetics 28-eyeshadow palettes as it is not the most expensive feeling and the talc scent is very overpowering. Nevertheless, it is not the worst packaging and will withstanding traveling. Besides, isn't it the product inside that really matters? 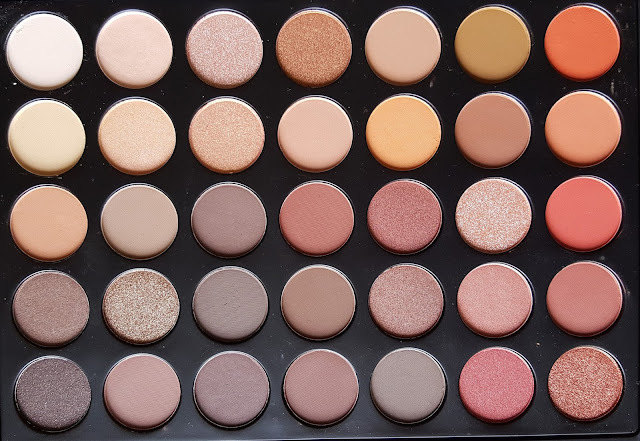 It is also important to note, however, that the eyeshadows do not have names, so for the purpose of this post I wanted to let you know that swatches will be done row by row, left to right. If you follow my blog at all, you know that warm neutrals have a special place in my heart. Now with that being said, the quality of the cooler tone shades in this palette certainly makes me want to dabble a bit on that side of the spectrum. I also love the fact that they included the foil texture throughout the palette (sixth shade in the third row, second shade in the fourth row, and last shade in the fifth row). Foil is a texture of eyeshadow that has a more slippery feel due to higher oil content in the formula and creates an ultra metallic finish on the lid even without dampening your brush. It is often found in more luxury brands, such as Make Up For Ever and Stila, but has recently been released in more affordable brands, such as Makeup Geek and now Morphe. I think those shades alone up the value of this palette tremendously. Now to address the elephant in the room: how do you plan on getting your hands on this palette? I get it. It sells out a few hours after it goes live on any website, but rest assured--this palette is in fact permanent, so at some point or another, it will become available to you. I would recommend looking in places other than just the Morphe website. Try Lady Moss, Ricky's NYC, or Frend's Beauty. Look around because this palette has been popping up in retailers other than Morphe Brushes. Good luck hunting, beauty addicts! Yes, do try to get your hands on it. It's definitely a must-have in my book.